Oak Solids with Walnut and Oak veneer. Three Center Drawers flanked by Doors with interior shelves. With upper deck unit consisting of two display compartments behind sliding glass doors, each with shelf with plate groove. Excellent vintage condition. 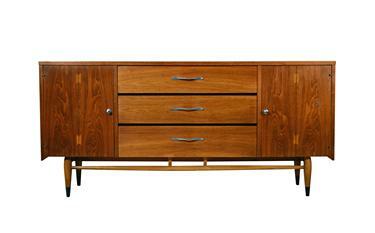 Attractively figured walnut and oak veneers with oak solids. This example produced in 1961. Very slight roughness highlighted in three photos of right facing door face; lower left side loss less than 1/2 inch; and roughness to "foot" detail of deck, left forefoot.